Musician Khalid Mustafa is the first Jordanian to be nominated for the international Big Apple Music Awards Foundation (BAMA) as Best Upcoming Middle-Eastern Music Producer. Organized by Daf Entertainment, the multicultural musical event honors creativity and global musical achievements from all over the world in a yearly ceremony. This year, it will take place on November 23, 2018 at the Dolby Theater, in Los Angeles, Hollywood. When asked about this achievement, Mustafa expressed his happiness, saying: "I am the first Jordanian to be nominated for this international award.” He pointed out that he will be competing with the most important music producers in the industry. He also said that he shares many memories with Roya TV. Programs like "Lose & Win" and "Manhaj" have contibuted to my exposure, Mustafa added. 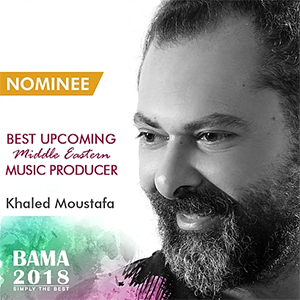 Both the ‘Best’ and the ‘Best Upcoming’ categories for a Middle Eastern Music Producer have well known names such as: Tooma, Elhamy Dehema, Hossam Kamel, Osama Samy, Mohamed Shafeq, Issam Shrayti, Talal Eidan, Egyptian music producer Nader Hamdy as well as Jordanian Khaled Moustafa.